Running stitch for TAST 2012 on rust and tea dyed cloth. I love the rust and tea-dyed fabric. It all looks so organic. Interesting this rust dyed fabric! Tolles Design! Gefällt mir sehr! this is fabulous! Thanks stopping by my blog so I could find yours. 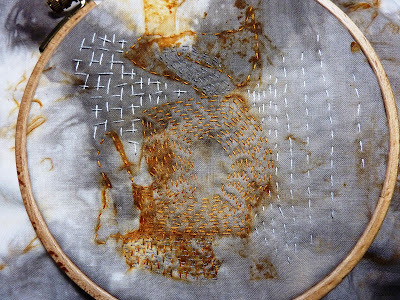 I am really enjoying your free form stitching Raphaela. I'm thinking maybe I should stop doing so much planning when I stitch. This is so modern, I love it! I've only recently discovered your blog, but I've enjoyed my visits. I'm passing on the Liebster Blog Award to you -- if you are interested, you can see the details on my blog, Bayou Quilts. Oh, jenclair, you overwhelm me! Thank you so much for the Liebster Blog Award. I need a little time to thing about it. And a thank you to all the commenters.